There is a continuous demand for passionate, creative experts, especially in the fields of Interaction Design, User Experience and Human Computer Interaction (HCI). 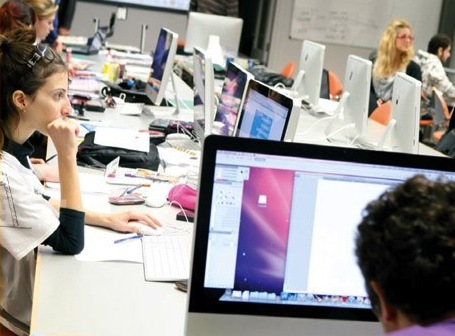 The program equips its graduates with immediate marketable skills in design, technology, and theory as related to the domain of Interaction Design, User Experience and Human-Computer Interaction. Interaction Design shapes the experiences of people as they interact with products in order to achieve their goals and objectives. Interaction designers define product behaviour, mediating relationships between people and people, people and products, people and environments, and people and services across a variety of social, cultural and technological contexts. e-Services, which reflect the recognition of information technology as a powerful tool for accelerating economic development, whose benefits include accessing a greater user base, broadening reach, lowering of entry barrier to new domains and cost of acquiring new audience, alternative communication channel, increasing services to enhancing awareness and perception, gaining competitive advantages and potential for leveraging knowledge. Our graduates can pursue careers as Content Strategists, Creative Directors, Creative Technologists, Design Strategists, Developers (front-end or back-end), Information Architects, Interaction Designers, Mobile Designers, Service Designers, Usability Specialists, User Interface Designers and many more. Our graduates have excelled as entrepreneurs and have been prepared for self-employability through successful pitching and presentation of their ideas and work to professional and public bodies as well as pursued suitable funding opportunities.